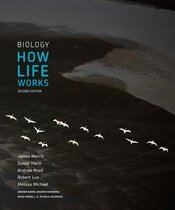 Biology: How Life Works was written in response to recent and exciting changes in biology, education, and technology with the goal of helping students to think like biologists. The text, visual program, and assessments were developed together to provide students with the best resources to gain an understanding of modern biology. Content is selected carefully, is integrated to illustrate the connections between concepts, and follows six themes that are crucial to biology: the scientific method, chemical and physical principles, cells, evolution, ecological systems, and human impact. The second edition continues this approach, but includes expanded coverage of ecology, new in-class activities to assist instructors in active teaching, new pedagogical support for visual synthesis maps, and expanded and improved assessment.